Not to be confused with Aragonese language. Aranese (Occitan: Aranés) is a standardized form of the Pyrenean Gascon variety of the Occitan language spoken in the Val d'Aran, in northwestern Catalonia close to the Spanish border with France, where it is one of the three official languages beside Catalan and Spanish. In 2010, it was named the third official language of the whole of Catalonia by the Parliament of Catalonia. 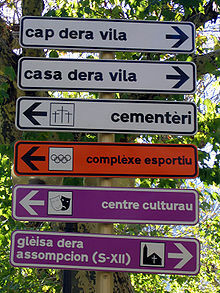 The official spellings of towns in Val d'Aran are Aranese; for example, the Aranese spelling Vielha is used on maps and road signs instead of the Catalan and Spanish Viella. 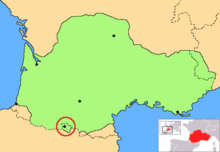 The Aran Valley is the only territory of all the linguistic domain of Occitania where Occitan has official recognition and institutional protection. According to Law 35/2010 passed by the Parliament of Catalonia, Aranese is considered to be not only a co-official language in the Aran Valley, but throughout Catalonia, being of preferential use in its natural territories (Valle de Arán). Article 3.4 of the Catalonia's 1979 Statute of Autonomy established that the "Aranese language will be the object of education and of special respect and protection". Subsequently, Law 7/1983, on linguistic normalization, declared Aranese the language of Aran, proclaimed certain linguistic rights of the Aranese and directed the public service to guarantee its usage and teaching. Aranese is taught at all levels of compulsory education and is also used as the vehicular language of teaching in the Aran Valley since 1984. A certain degree of autonomy was granted to the Aran Valley in 1990. Law 16/1990, concerning the special regime of Valle de Arán, grants to the Valley a regime of administrative autonomy. This law affirmed the official status of Aranese, improved its guarantees of use and teaching, and included the general mandate to promote its normalization in Aran. Law 1/1998, on linguistic policy, included specific provisions related to place names, anthroponymy and the media. Although the place names of Catalonia have ther officials names in Catalan, the place names of the Aran Valley have their official names in Aranese. Thus, the indicators of the towns and the names of their streets are written in Aranese. Since May 2001, there is an official regulation of the General Council of Aran that regulates the certification system of the different levels of knowledge of Aranese. In 2006, a new Statute of Autonomy of Catalonia was promulgated. Concerning Aranese, article 6.5 of the organic law establishes that "the Occitan language, called Aranese in Aran, is the language of this territory and is official in Catalonia, in accordance with the provisions of this Statute and the laws of linguistic normalization." In 2010, Law 35/2010 was subsequently passed and concerning Aranese in Catalonia reflecting the new constitutional framework. In 2011, the Spanish Government, specifically that of the Popular Party and Citizens, opposed the preference given to Aranese by the 2010 law, questioning the constitutionality of articles 2.3, 5.4, 5.7 and 6.5. In 2018, the constitutional court ruled that while article 2.3 was found to be constitutional, the "preferential" status given found in the other concerned articles to be unconstitutional. According to a 2001 linguistic census by the Aranese government, about 90% of the inhabitants of Val d'Aran can understand the language, with those between 25 and 34 years old having the lowest rate, at around 80% (excluding those under the age of 4). Between 60 and 65% of the population can speak it; however, only 26% reported being able to write in Aranese. In 2008, the Generalitat of Catalonia surveyed the population (15 years old or older) in the Val d'Aran. The survey reported that 78.2% of the population could understand Aranese, 56.8% could speak it, 59.4% could read it, and 34.8% could write the language. Once considered to be an endangered language spoken mainly by older people, it is now experiencing a renaissance; it enjoys co-official status with Catalan and Spanish within Val d'Aran, and since 1984 has been taught bilingually alongside Castilian in schools. Students in the Val d'Aran are required to have 2 hours of each Spanish, Catalan, and Aranese each week. At some levels of education, a foreign language is added to the three official languages—usually French due to proximity—and sometimes even 2 additional hours of English. The voiced stops /b/, /d/, /ɡ/ are devoiced to /p/, /t/, /k/, respectively, in word-final position. /h/ is pronounced only in the towns of Bausen and Canejan. Foreign words that have not been adopted into Aranese also retain /h/: hardware, maharajah. /ɾ/ is pronounced [ɾ], except at the end of a word, where it is generally silent, regardless of what follows. In practice, stressed ei tends to be pronounced [e]: trueita pronounced as trueta. Orthographic ui historically was a diphthong, but is currently produced as [y]. Spanish and Catalan have also created deformations of words such as abans > abantes or dempús > despuès. Some Hispanicisms are directly adopted into Aranese: hasta. Aranese is regulated under classic unifying standards of Occitan, defined initially by Loís Alibèrt. These standards of the Conselh de la Lenga Occitana (Occitan Language Council) have officially been recognized by the Conselh Generau d'Aran (General Council of Aran) since 1999. The Institut d'Estudis Aranesi is the recognized language academy by the Conselh Generau d'Aran. A reference on usage and conjugation of Aranese verbs entitled Es Vèrbs conjugadi : morfologia verbau aranesa was written by Verònica Barés Moga and published in 2003. A descriptive and normative reference grammar book, written in Aranese by Aitor Carrera, was published in March 2007. It includes a detailed breakdown of phonological and grammatical differences between varieties of Aranese in different villages in the valley. A dictionary of Aranese was written by the Catalan linguist Joan Coromines as his doctoral thesis. A simple four-language Spanish–Aranese–Catalan–French dictionary exists, written by Frederic Vergés Bartau (see Bibliography). An Aranese-English and English–Aranese dictionary was published in 2006. It was written by Ryan Furness, a young man from Minnesota, after he became curious about the language when he traveled to Val d'Aran. A detailed one-volume Catalan–Occitan and Occitan–Catalan dictionary was published under the auspices of the governments of Catalonia (Generalitat de Catalunya) and Val d'Aran (Conselh Generau d'Aran). Although it calls the language "Occitan", it uses Aranese spelling and its preface says that special attention is given to the Aranese variety. A local monthly magazine Toti and local newspapers are published partly in the language. ^ Hammarström, Harald; Forkel, Robert; Haspelmath, Martin, eds. (2017). "Aranese". Glottolog 3.0. Jena, Germany: Max Planck Institute for the Science of Human History. ^ https://www.iana.org/assignments/language-subtag-registry/language-subtag-registry; IANA language subtag registry; retrieved: 15 October 2018. ^ "El Tribunal Constitucional tomba la condició de "preferent" de l'aranès". EL PAÍS (in Catalan). 12 February 2018. ^ "El TC declara inconstitucional el carácter de "preferente" del aranés en su territorio". ELMUNDO (in Spanish). ^ "BOE.es - Documento BOE-A-2018-3301". www.boe.es (in Spanish). ^ "Aranese language becomes the 3rd co-official language in Catalonia", Catalan News Agency, 2010. Retrieved on 22 August 2014. Barés Moga, Verònica (2003). Es vèrbs conjugadi: morfologia verbau aranesa. Barcelona: Llibres de l'Index. ISBN 84-95317-47-8. Carrera, Aitor (2007). Gramatica Aranesa (in Occitan). Lleida: Pagès Editors. ISBN 978-84-9779-484-8. Furness, Ryan C. (2006). Diccionari Occitan (aranés) - Anglés/English-Occitan (Aranese) Dictionary. Pages Editors. ISBN 978-84-9779-362-9. Leclerc, Jean-Marc (2004). Le Gascon de poche (in French). France: Assimil. ISBN 2-7005-0345-7. Vergés Bartau, Frederic (1991). Petit diccionari: castelhan-aranés (occitan)-catalan-francés, aranés (occitan)-castelhan-catalan-francés. Vielha, Vall dʾAran, Lhèida : Conselh Comarcau dera Val DʾAran. ISBN 84-606-0175-7.